Modern day living creates copious amounts of rubbish. We can all do our bit to reduce, recycle and reinvest. Avoiding unnecessary packaging, using recycling facilities for glass bottles, cans, newspapers and plastics and clothing or unwanted goods and composting our vegetable waste can reduce everyday rubbish enormously. Once we have done everything we can to personally reduce our refuse, the remaining waste can then be treated with crystals to reduce its negative energy and impact on our health. Amethyst crystals can be planted around our own rubbish and recycle areas, around community recycling sites and around landfill sites. This produces a protective circuit, containing and transmuting the negative energy of the waste within and reducing its negative effect on all within its vicinity. 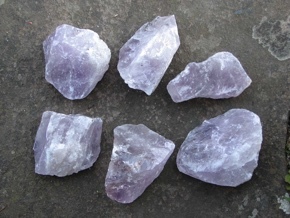 Crystals can also be used to energy manage personal release of waste in bathroom areas. This leaflet explains how to use programmed crystals to rubbish and recycling areas in our homes, schools, workplaces and communities, to landfill sites and to bathroom areas. There are also Action Sheets to programme and plant your own crystals to refuse and recycle areas, to landfill sites and to protecting homes near landfill sites.